Dressed in black and ready to stalk through the night, Gotham’s most notorious prowler, Catwoman, joins Sideshow’s Premium Format™ collection. A stunning recreation of Michelle Pfeiffer’s iconic portrayal from Batman Returns, this piece celebrates all nine of her lives. Clad in her signature skintight leathers and with her whip coiled around her, Ms. Kyle has a way of making most people feel as if they are nothing but a ball of yarn. I'm glad I jumped on to order this as soon as preorders were available. Love the likeness and it's top shelf quality! This was my first piece from Sideshow and she is just amazing. The likeness to Michelle Pfeiffer is quite literally purr-fect. Batman Returns Catwoman is a win! I had no paint issues, nothing broken, and love this art in my collection! 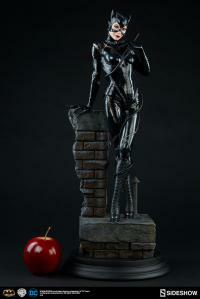 I just wish I could purchase statues of other versions Catwoman from Sideshow that I missed in the past! Luckily I have my two favorite which includes this one. I'm very lucky to have bought the Batman Returns (1992) Catwoman before she sold out. As you may have guessed I am a 90's kid so this is just pure 90's nostalgia at its best. This was my childhood brought to life. Amazing sculpt and pose, the pictures dont do her justice. She will not disappoint once you have her in your hands. No wonder Batman loves her. I know there was a lot of controversy about her likeness in the unveil pictures, but once the statue is in hand it is flawless. Sideshow gives us another master piece. This is a statue that once it is sold out people will kick themselves for not purchasing it. Very nice base and a good likeness of Michelle Pfeiffer especially her cute nose and lips. I got mine next to Keaton Bats and she is just ready for some action. Michelle Pfeiffer should be proud to have her image on this piece of a life time. I'm soooo loving this ART. Sideshow Collectibles has a KILLER pairing, this goes hand and glove with my Michael Keaton Batman and my collection has been ELEVATED!!! Got mine in a week ago and I love it. Must have for any Batman Returns fans. Hope Sideshow makes a Jack Nicholson Joker or a Danny Devito Penguin next! I just received mine and she is beautiful! The likeness to Michelle Pfeiffer is spot on! Great job SS! Is Penguin coming soon?